The Women’s Centre has a long history of removing barriers to participation and progression through delivering community education programmes for women in Waterford since 1995. In addition to our community education/development courses and crèche, the Centre was recently granted planning permission to open a community cafe and second hand shop at our premises 74 – 76 Manor Street, Waterford. We are now in a position to deliver a ‘learn by doing’ course for women 18 years upwards and offer an opportunity to experience working in the Women’s Centre within a learing framework. 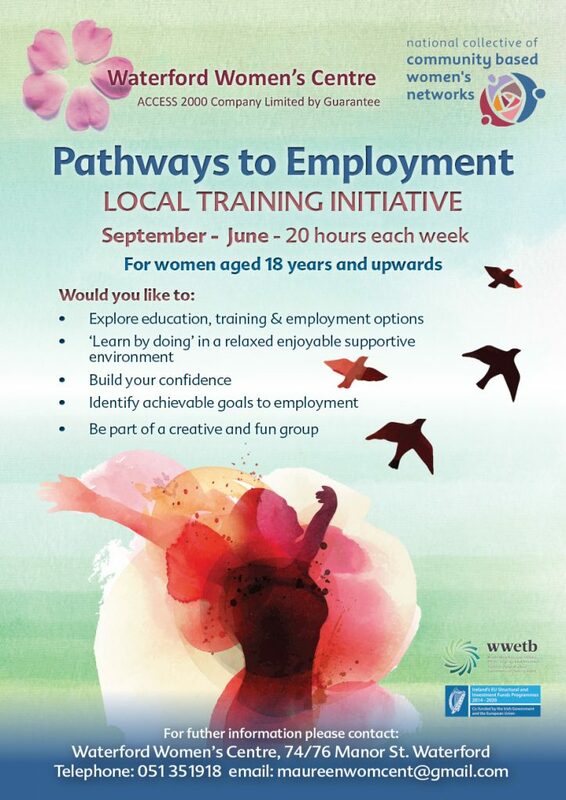 Using our available assets: 22 years’ experience of working with women, crèche, community development/education project, cafe, second hand shop and support services for women, the Centre is in an excellent position to support women explore options and offer opportunities to ‘learn while doing’ in a supportive environment. Participants will be facilitated to develop personal awareness and self-confidence and identify and address gaps in existing skills in order to support progression.